Sony Online Entertainment has been showcasing H1Z1, their open-world zombie survival game, at as many trade events as possible, including E3. The latest video comes courtesy of MMO Attack where they interview (or mostly just listens to) senior designer, Jimmy Whisenhunt, about the upcoming title as it preps for Early Access on Steam for PC. We actually learn a ton of stuff about the upcoming title, including getting a look at the new and improved tree-chopping animations that actually sees the tree falling in a proper order with a proper animation. Previously trees “exploded”. Whisenhunt also walks gamers through the new and improved crafting mechanics, examining the game's easy new way to churn out items and gear on the fly. Things have been simplified to the point where if you can craft and make stuff in Minecraft then you can craft and make stuff in H1Z1. One of the more impressive feats that was demonstrated in the video was base building. The game has an option that enables you to build support structures. 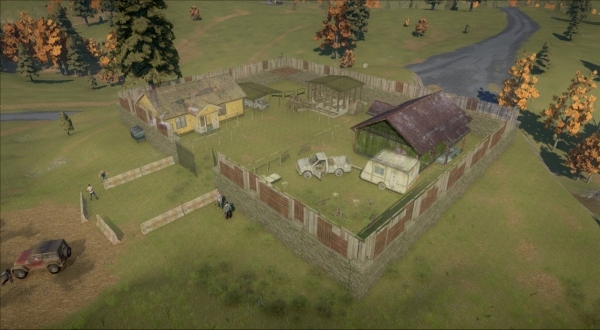 What happens here is if you have the proper and necessary crafting materials you can construct a support structure that enables you to build houses, bases, vehicle pads or store houses on top. It's a really cool feature that offers a lot of different possibilities within the game. In addition to the support structures are the new water filters. These small stations will collect rain water and purify it for users. If you don't have a filter to purify the water then you'll end up drinking contaminated water and in result risk getting an infection or losing some health. This creates an interesting dynamic as players might find some users as a great resource for trading purified water for things like bullets or car parts. It opens up a really cool emergent dynamic to the game world. Speaking of infections and contamination... Whisenhunt explains that weather can affect the state of a player's being, very much so like DayZ. This means that you'll need proper clothing or shelter if you hope to survive whenever the weather gets exceptionally harsh in the world of H1Z1. One of the other things I thought was pretty cool was the ecosystem that's in play. Wolves will hunt smaller animals, smaller animals will attempt to run and hide and players and zombies get to stay caught up in between them all. It's a lot like Far Cry in a way and that's definitely a good thing. I don't know if H1Z1 will be as fun or as tense as Bohemia Interactive's DayZ, but it definitely has a lot of potential. For as far as I can tell, it seems to be a soft meeting point between State of Decay and DayZ. SOE is planning on rolling the game out to Early Access “soon”. Shortly after launching on PC, the team plans to bring the game to the PlayStation 4. You can learn more about the game by paying a visit to the official website.